Mary, Queen of Heaven School boasts a strong academic program and small class sizes, with an average student to teacher ratio of 18:1. 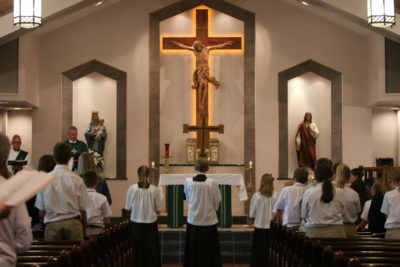 Our school curriculum follows a rigorous approach with innovative educational practices, while we embrace and share the traditions of our Catholic faith and church. The spiritual and academic growth of our students is our priority. Our children are encouraged to be independent learners who are motivated, prepared and responsible. The curriculum is geared to meet the needs of the individual student. Physical Education, Music, Art, Computer Instruction, Library and Spanish are a regular part of the curriculum in grades K through 8. Mary, Queen of Heaven School is proud to have a STEM program offering all students opportunities during in-school enrichment classes to enhance their interest and learning in the areas of science, technology, engineering, and math. Academic Intervention Services are provided on an as needed basis as well as Academic Enrichment. The dedicated and enthusiastic staff at Mary, Queen of Heaven is committed to providing extra assistance as well as enrichment in all classes. This year we are excited to have become a 1:1 technology school in grade K-8. iPads are available for every student in the early grades. They are used regularly for a variety of support and enrichment activities in the K to 3 classrooms. Chromebooks have been integrated into grades 4-8 for every student. This technology allows for teachers to broaden the methods and approaches to their curriculum, while teaching programs and computer skills that will prepare our students for high school and beyond. Mary, Queen of Heaven is a small school with big academic opportunities!